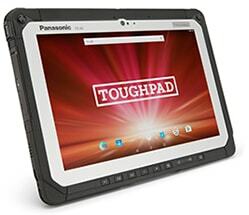 Deploy the FZ-A2 across your entire fleet with confidence knowing it’s been tested to Panasonic’s high standards. Ideal for Microsoft Windows field work applications, the FZ-A2 supports legacy I/O options via its unique configuration port. 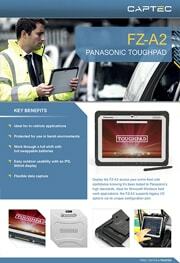 With a large, easy to read 10.1-inch display and a fully rugged design to protect against hazards when dismounted, the Pansonic Toughpad FZ-A2 is an ideal foundation for Captec in-vehicle solutions. Work both in-vehicle and out of it in any weather, with full IP65 ingress protection. 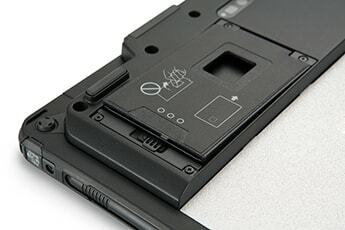 Optional dual hot-swap batteries allow you to stay untethered, meaning you never have to shut down apps while changing a battery. Continue working even in bright sunny conditions with a vivid IPS, high brightness sunlight readable display. 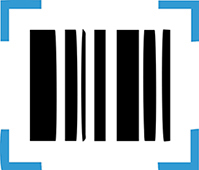 Optional 2D barcode module allows for quick and accurate data capture.